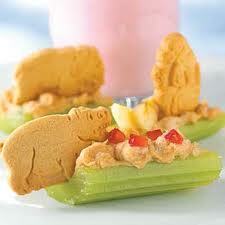 Preschool age kids love little animals, and this quick snack is packed with protein, fiber, and goodness. To make these little peanut butter logs, spread peanut butter inside 2 inch pieces of celery, and top with chopped strawberries or raisins. Place an animal cracker inside the peanut butter, and watch your kids gobble them up. No raisins in the house? Call them "Ants on Vacation!"